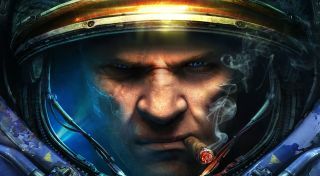 These StarCraft 2 cheats make you a god in singleplayer. StarCraft 2 cheats are great for blasting through the game's singleplayer campaigns, whether you're taking on Wings of Liberty, Heart of the Swarm, or Legacy of the Void. A word of warning before you start breaking the game: all of the following cheats will disable achievements for that campaign. To get those achievements you'll have to start a new campaign or load an earlier pre-cheat save. These cheats don't work in multiplayer. Applying unofficial cheats or cracks to multiplayer is a big no-no, obviously, and might get you banned from Battle.net. To use these cheats, simply press enter during a singleplayer campaign to open the speech box, and type the following. You should see the effect of the cheat happen immediately, and the chat log will say CHEAT in all-caps. Enjoy! During the Media Blitz mission guide your Odin mech to the bottom right of the map and destroy the science facility at the end of the road. Pick up the documents that come out of the wreckage and look out for the secret mission Piercing the Shroud on the mission select screen. You have to complete it before heading to Char. In Wings of Liberty, during the fiery Devil's Playground mission head to the bottom right of the map to find Diablo. You can't kill him or interact with him in any way, but there he is. In Heart of the Swarm in the Roach Evolution mission after you've evolved and are heading towards the next set of enemies, keep an eye on the containment chambers on the top wall of the facility. Diablo's chilling out in one of those too. In the mission Unsealing the Past, set on Endion, you can find Ewoks all over the place, huddling around camp fires and hiding behind trees. There's also a Jurassic World reference in this level. There's an 'enhanced strain' blue Zerg monster called Indomilisk Rex, a pastiche of Indominus Rex from the film. In the mission Zero Hour clear out the Zerg infestation in the top left of the map. Move beyond it and you will find a level 80 Tauren marine in power armour. Treasure your brief time with him, because your appearance causes him to run into a nearby toilet and never come out. In Legacy of the Void, in the Templar's Charge mission, move your base platform up, up, up, down, down, left, right, left, right. The Tauren Marine lands with a nuclear explosion and you can control him as a unit. Blizzard has been quiet about StarCraft's future, but you never know, we might hear something at Blizzcon 2018.